This article is about the bodyguards of Pelagius the Suspicious. For the bodyguard of Plautis and Salonia Carvain, see Bodyguard (Carvains). 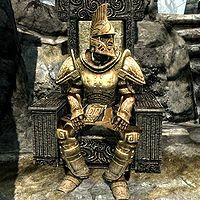 The Bodyguards are two Nord citizens who sit on either side of Pelagius the Suspicious during the quest The Mind of Madness, observing the arena fight between two atronachs. They wear Dwarven armor with matching boots, gauntlets and a helmet. When you hit one of them with the Wabbajack, they will both turn into wolves and kill Pelagius. This page was last modified on 16 November 2013, at 21:06.